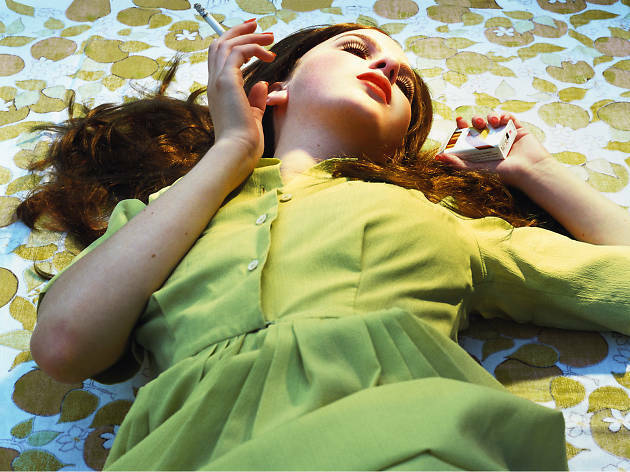 You get an eerie sense of déjà vu in this show of American artist Alex Prager’s photography. Seeing the drunken parties, suspicious faces and elaborate beach scenes she meticulously stages, you’re certain that each scenario is familiar – is it a classic American film you’ve seen a thousand times but can’t quite remember? Is it an old 1970s Coke ad? A vintage sitcom? It’s none of these things, it’s all fake. Prager is precise and dedicated, setting up each shot with countless extras and finicky precision. A group of girls conspire in their swimsuits beneath an onrushing plane, three men hover over the viewer as if you’re a corpse they’ve just discovered, a woman flees from a flock of pigeons. You, the viewer, see the crowd at a cinema as if you’re the screen, you see a beach from up high like you’re an airborne beach ball. Prager sticks you in it. You’re a character in these familiar yet totally alien scenes. Are you the director of these fake movies? Are you complicit in Prager’s fictional crimes? Are you the audience? Through her perfectly staged photographs and gorgeously immersive films – like moving versions of her still images – she dumps bucket after bucket of cold, isolating paranoia over you. She makes you live in Cold War, nuclear, glamorous, ’70s Hollywood. It’s a suffocating, inescapable and almost physically oppressive world she creates where you have no idea what’s real or fake. All you can know for sure is that Hollywood is a really weird place.